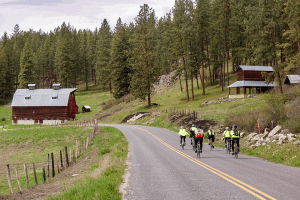 Description: The Colville Loop is the heart of the Bike Northeast Washington experience. It is a spectacular 34.3 mile loop on rural roads around the city of Colville. The Loop offers a great way to first experience the area. Go north on Williams Lake, a busier road for 1.5 mi. Turn right onto lightly traveled Gillette/Douglas Falls  for a gentle 6.2 miles of woods, fields and quiet country solitude. Stop in at the Douglas Falls campground just off the road to view the waterfalls and refresh. At  you are at Pinkney City, site of the old Fort Colville military post. Merge onto busier Aladdin for a half mile and then head east onto sparsely traveled Knapp . 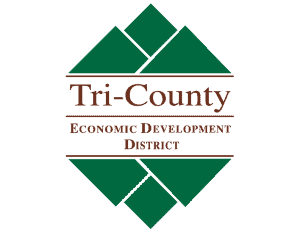 Enjoy three and a half miles of Stevens County bucolic splendor. Turn east onto Hwy 20 , the route traveled by thousands of cross-country bikers on their way across the continent. After 3.2 miles leave Hwy 20 onto Artman-Gibson  and coast and peddle 5.4 miles past lakes, ranches, and a glorious vista of the Little Pend Oreille River Valley. Once down again onto the valley floor , travel short distances south and west  and cross Hwy 395 . Climb Arden Hill (the only challenging hill on the Colville Loop) to Skidmore . Don’t want to do the Arden Hill? At  you can head north back to Colville on Old Hwy Arden and other routes.